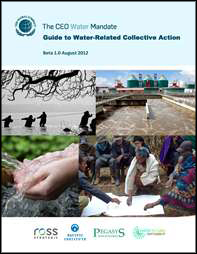 September 16, 2013, New York, NY: The UN Global Compact’s CEO Water Mandate initiative has released the Guide to Water-Related Collective Action, which provides a step-by-step approach to water-resource-related collective action. The Guide, finalized after a year of testing and research on a beta version, helps businesses develop strategy focused on effective, sustainable, and equitable external engagements related to water. There are many forms of collective action, and the Guide helps a company identify the type most suitable for the present situation. This includes looking at interdependence between actors and the capacity to execute collective action, as well as the internal and external interests to engage. The Guide addresses both expectations management and clarity of communication, two factors critical to success. It is built around the idea that corporate management processes are often iterative and cyclical, as opposed to linear, and it includes looking at existing collective actions and stakeholder efforts on the ground before spearheading new projects. The Guide helps companies establish good internal alignment with the drivers for collective action and creates an explicit link to principles of policy engagement, as captured in the CEO Water Mandate’s Guide to Responsible Business Engagement with Water Policy. The Guide to Water-Related Collective Action can be downloaded free of charge from the Pacific Institute website at www.pacinst.org/publication/guide-to-water-related-collective-action and on the CEO Water Mandate website at www.ceowatermandate.org. It can be used in conjunction with the Mandate’s Water Action Hub (www.wateractionhub.org), the world’s first on-line platform to unite companies, governments, NGOs, and other stakeholders on a range of critical water projects in specific river basins around the planet. The Guide was developed by the CEO Water Mandate in partnership with Ross Strategic; Pegasys Strategy and Development; the Pacific Institute; and the Water Futures Partnership.